Now, just to be clear, the following recipe is for the perfect [insert your favourite ingredients here] omelette. It’s light and fluffy and oh so good! I used large cooked tiger prawns because I’ve had a hankering for them for a while, and since I picked up a handsome bunch from the Fish Markets the other day and Mr Chipconnoisseur is not a big fan, I had a handful left over. Perfect Boxing Day breakfast if you love your seafood at Christmas. Chives and chilli are there for some colour and heat, while mayonnaise keeps the omelette and prawns nice and moist. Yummy yum yum. You can use lightly fried chorizo or pieces of field mushrooms for a vegetarian version. Since I’m a sucker for the mushroom cheese combo, I would recommend grating about 1tbsp of cheese into the 2 egg mix. You can use chorizo, mushrooms, cherry tomatoes, capsicum or whatever else tickles your fancy instead of the prawns. Heat oil in a small frypan over a medium burner until very hot. Pour in beaten egg mixed with chives and cook on high for about 1 minute. Reduce heat to medium and cook for further 2 minutes. 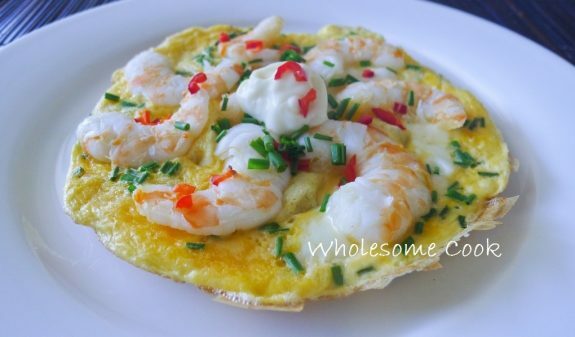 Arrange prawns on top of the omelette, cover and cook for another 2 minutes, or until the egg is set on top. Slide onto a plate, sprinkle with chopped chilli and a dollop of mayo. I love this, it looks delicious!